A very scenic alternative to the main drive between Capertee and Rylstone, through the grand Capertee Valley. 'Big sky' outback atmosphere with the weathered escarpments of Wollemi National Park and Gardens of Stone National Park winding around the valley. Cliff-lined valleys, Glen Davis and the Capertee Gorge, Dunns Swamp camping, swimming and walks. The roadside Pearsons Lookout, on the Castlereagh Highway just south of Capertee village, gives a view over the expansive Capertee Valley that you are about to explore. Turn off the main drive at Capertee, onto the Glen Davis Road. The sealed road winds through open forest backed by sandstone crags. On the right (to the east), Gardens of Stone National Park sweeps up to the outstanding mesa of Pantoneys Crown. Away to the north, beyond the valley, the conical top of Tayan Pic forms a volcanic landmark. Emerging from the forest into rolling farmland, the road becomes unsealed and heads towards the massive cliff of Mount Gundungaroo guarding the entrance to Capertee Gorge, where the broad valley narrows down. You might be lucky around here to spot one of Australia's most endangered birds. The yellow and black Regent Honeyeater migrates each winter from as far as Victoria to nest in River Oaks along the stream and feed in the eucalypt trees. A replanting program is trying to improve the habitat for this special resident. Just across the bridge over the Capertee River (which may be dry) and 28km from Capertee, turn right at the T-junction and continue 4km between tall cliffs, across the river again, to the old shale-mining village of Glen Davis. The relics of the early 20th century shale refining works are on private land but tours and accommodation can be arranged at the hotel. The strenuous Pipeline Pass track leads over the range to Newnes in the Wolgan Valley - a full day's return walk. The camping area on the southern side of Glen Davis has all facilities. A picturesque alternative is to turn left into Goora Street just before crossing the river on the way into town and follow the signs along a rough dirt road, down the valley and across the river to Coorongooba in Wollemi National Park. This is a basic camping and picnic site with no facilities. Beyond, the Capertee River enters the Wollemi Wilderness and joins the Wolgan River to form the Colo River. The gorge extends for over 100km - reputedly one of the longest gorge systems in Australia. Drive back out of town the same way, and at the T-junction near the Capertee River bridge, continue straight ahead on the Glen Alice Road. The unsealed road leads another 8km to the even smaller village of Glen Alice, and then north-west through the rural upper Capertee Valley. The road son changes to sealed then you pass beneath the towering massif of Mount Marsden and across the relatively humble Great Divide, entering the westward-draining Cudgegong Valley. Some 35km from Glen Alice, two turnoffs to the right onto the Narrango Road are reached. Follow Narrango Road (at first sealed, then unsealed) east about 20km to the turnoff into Dunns Swamp on the left. Dunns Swamp is a quiet waterway created by a weir on the Cudgegong River. The water supplied the cement works at Kandos but is now rarely used. Fine camping is available (fees apply) amongst pagoda rocks and the swimming, canoeing and birdwatching in the quiet backwaters is excellent. A rock art site is part of the rich Wiradjuri heritage of the area, and several walking tracks explore the swamp, forests and rock formations. 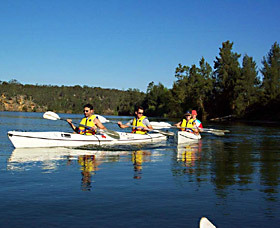 Boat tours and hire canoes are available during weekends and school holidays in spring and summer. When leaving Dunns Swamp, travel back along Narrango Road to the delightful town of Rylstone, where you can continue north on the main drive.